Atomikitty, AKA Susannah Mosher, is a Painter, Freelance Illustrator & Graphic Designer living in Los Angeles CA. A California Native, Susannah was born in the surf-side town of Santa Cruz. 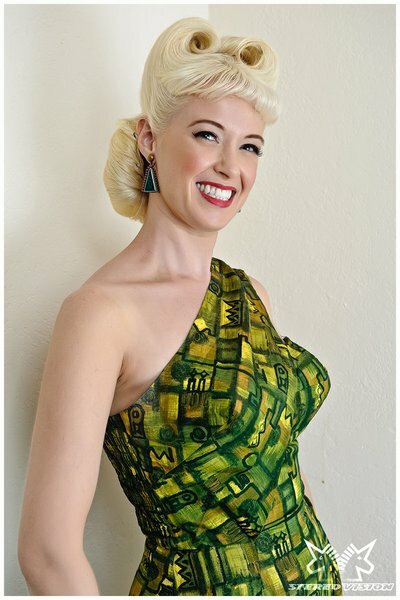 She put herself through art school by bartending, and her love of Tiki and Vintage Cocktail Culture springs from these colorful and formative years. She graduated with her BFA from the Academy of Art College, San Francisco in 2004. Her current work in the Toy Industry and related Children's Markets include Concept Design and Product Development, Deco Design for existing brands and Packaging. In addition, she regularly exhibits her Tiki, Low Brow & Pin-Up artwork in galleries throughout the country. She is a member of Girls Drawin' Girls ~ a group supporting and promoting female animators, illustrators and pin-up artists. When she is not busy painting and plotting, she collects mid century design, vintage clothing, big-eye art, coconut monkeys and dust bunnies.